By now, we’ve heard every side of the “J.J. Watt for MVP” debate. It’s a lot of talk about the meaning of “most valuable” compared to “best” and whether the award is unfairly slanted toward quarterbacks — or if, in today’s game, a quarterback just should win every year. We’re not going to rehash all of that. Instead, we’re going to look back at some of the other defensive players — all Defensive Player of the Year winners — who have had a reasonable case for the MVP since 1987, the year after Lawrence Taylor was the most recent defender to win it. The goal here is twofold: to remember just how hard it is for a defensive player to win, and to figure out some of the reasons those players didn’t end up winning — both of which should give us some context for Watt’s 2014 performance. Whenever I think about Reggie White, I think about a story I heard years ago from one of White’s ’87 Pro Bowl teammates. More than once during a game, the story goes, White came back to the huddle and declared that, on the next play, he was getting a sack. It wasn’t boastful. It wasn’t a joke. It was just going to happen, and he wanted everyone to know. He finished with four sacks and was named the game’s MVP. White was a casual destroyer most years, but his third campaign in Philadelphia reached another level. The single-season sack record will always require a parenthetical, because when White had 21 en route to winning the Defensive Player of the Year award, he did it in 12 games. He was unstoppable. Why he didn’t win: After two awards in the previous 16 seasons, a defensive player was never winning two years in a row. Another problem: The Eagles just weren’t very good. Philadelphia lost all three of its games during the strike, and the Eagles ended up 25th in scoring defense. Score one for the “a defensive player can have only so much impact” crowd. The Dome Patrol is rightfully considered one of the best linebacking groups ever. In 1992, a year after Swilling was named Defensive Player of the Year, all four Saints linebackers went to the Pro Bowl — which hadn’t happened before and hasn’t happened since. But in 1991, the gap between Swilling and his teammates was just a bit bigger. 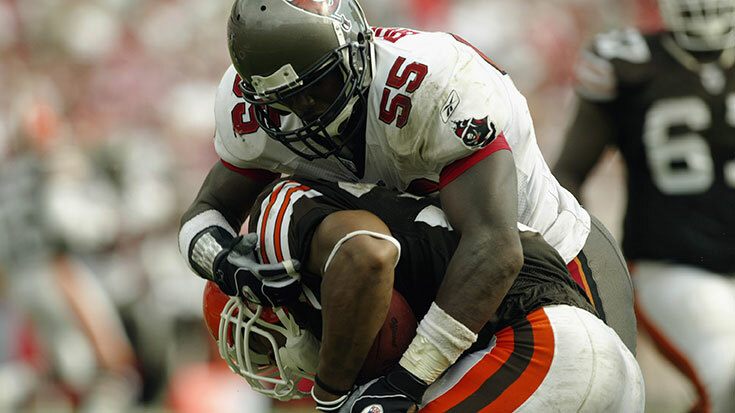 His 17 sacks led the league and his six forced fumbles tied for second; both were the best marks of his career. Swilling also returned his lone interception for a touchdown in New Orleans’s narrow Week 1 win against the Seahawks. The Saints won a bunch that year — going 11-5 and winning the NFC West — and they did so behind the scariest defense in football. The Saints gave up a league-low 13.2 points per game, the first of two straight seasons they’d lead the NFL in scoring defense. Like a lot of the players on this list, and a lot of guys who end up winning DPOY, Swilling was the best player on the league’s best defense. Why he didn’t win: At 13-3, the Bills were the best team in football that season, behind an offense that averaged nearly 29 points per game. Thurman Thomas was primarily responsible for that. He rushed for 1,407 yards, but what likely swung the vote was the additional work he did in the passing game. Thomas caught a career-high 62 passes that season and added five receiving touchdowns to the seven he scored on the ground. “Absolute mess” doesn’t begin to describe the Seattle offense in 1992. Pick any stat. Seattle scored 140 points, the fewest in league history. That’s good enough for an average of 8.8 a game. The Seahawks threw nine touchdowns, compared to 23 interceptions. It was a train wreck. The bright spot amid a 2-14 season was Cortez Kennedy. The third overall pick in 1990, Kennedy put together a Hall of Fame career, but 1992 was his masterpiece. Getting 14 sacks as a defensive tackle is ridiculous enough, but what’s even crazier is that he finished the year two tackles shy of the team lead. It shouldn’t be possible to make the type of impact that Kennedy did as an every-down interior lineman. Why he didn’t win: Players on 2-14 teams don’t win MVPs, and for the most part, they don’t win DPOY either. (Just ask Watt.) Kennedy coming away with it that year is proof of just how dominant he was. That Deion’s 1994 season even happened is among the coolest things in the history of sports. It took Major League Baseball canceling its season for Sanders to wind up in San Francisco. Starting just 12 games — he arrived three weeks into the campaign — Sanders had the best regular season of his career. He picked off six passes and brought three of them back for scores. The Niners finished third in pass-defense DVOA, up from 14th the season before. He was good enough in three-quarters of a season to win Defensive Player of the Year, and the Niners went on to win the Super Bowl. That offseason, Sanders signed a $35 million deal with Dallas. He started 15 total games for the 49ers, and if it seems like more, it’s probably because he squeezed what most guys would consider a career full of highlights into less than a season. Why he didn’t win: His Hall of Fame quarterback burned the league down. Steve Young’s 1994 makes no sense. He completed 70.6 percent of his passes, threw for nearly 4,000 yards, and tossed 35 touchdowns. Oh, and he also ran for seven more. That’s absurd. Based on how the 2000 season ended up, I’m guessing there are people who think Lewis was the MVP. He won that award in the Super Bowl, but Lewis finished tied for fifth with Peyton Manning in regular-season voting. Both got just a single vote. Anyone trying to figure out just how hard it is for a defensive player to win can probably start here. There isn’t much to say about the Ravens’ defense in 2000 that hasn’t already been said. Few teams have ever been better. Baltimore’s insane playoff run (5.75 points, 209 yards allowed per game) informs how we remember that team, but the regular season wasn’t much different. The Ravens gave up 10.3 points per game and had four shutouts — as in: four! Lewis was the centerpiece of that defense. If the MVP were actually given to the best player, it would have been his. Why he didn’t win: Two words: Marshall Faulk. In Year 2 of the Greatest Show on Turf, Faulk’s numbers were unbelievable: 1,359 yards on 5.4 yards per carry, 18 rushing touchdowns, 81 (!) catches for 830 yards and eight more touchdowns. The guy scored 26 touchdowns and gained 2,189 scrimmage yards as part of a historically great offense. And he did it despite missing two games. Faulk’s 2000 belongs in any conversation about the best individual offensive seasons ever. As people go nuts about all of Watt’s touchdowns, Derrick Brooks must be somewhere laughing. The best player on maybe the greatest pass defense ever, Brooks returned three interceptions for touchdowns in Tampa Bay’s first five games. The 2002 Bucs defense was just as dominant as the Ravens in 2000, and Brooks added a bunch of MVP-bait splash plays to go along with, ya know, being consistently incredible. It’s a very specific way of looking at position, but the conversation about the best 4-3 outside linebacker ever isn’t really even a conversation. Brooks was a tackling machine on top of being among the best coverage linebackers ever, and 2002 was his peak. Yet just like Lewis in 2000, Brooks got merely a single MVP vote. Why he didn’t win: Rich Gannon was remarkable in 2002, throwing for 4,689 yards at age 37, but 2002 was a perfect example of how flawed the NFL’s MVP voting is. Oakland didn’t even have the best offense in football. That honor goes to Kansas City, which led the league in both DVOA and scoring, behind a 1,600-yard, 21-touchdown season from Priest Holmes on the ground. The best case for an offensive player winning that season probably goes to Holmes, who had 2,287 of the Chiefs’ 6,141 yards from scrimmage, but we’ve learned by now that any close decision goes to the quarterback. A number of other seasons might actually be Urlacher’s best, but 2005 was the height for Lovie Smith–era defenses in Chicago. The Bears won 11 games — 10 of which came with a rookie Kyle Orton playing quarterback — and they were comfortably the best defense in football, according to both scoring average and DVOA. Chicago won its division with a quarterback that completed 51.6 percent of his passes and averaged 5.1 yards per attempt — the second worst and the worst marks in the league, respectively. Just think about that for a second. Still, even as the best player on the league’s best defense, Urlacher didn’t receive a single vote for MVP. Why he didn’t win: Seattle won 13 games and Shaun Alexander got into the end zone 28 times. No one else is winning the MVP when a back on a 13-win team rushes for 1,800 yards. Some people might say Harrison wasn’t even the best defensive player on his own team, but that says more about how great Troy Polamalu was than anything. Harrison was terrifying that season, and so was the Steelers defense. Pittsburgh comfortably ranked first in both scoring defense and DVOA, thanks in large part to Harrison’s success rushing the passer. He finished with 16 sacks, but the seven forced fumbles is even more impressive — impressive enough that Harrison actually did better in the MVP voting than just about everyone on this list. He finished with three votes, which was far behind Peyton Manning, but only one fewer than Chad Pennington and Michael Turner. Why he didn’t win: Credit being split between him and Polamalu probably isn’t the sole reason, but it’s the only one that makes sense. This was easily Manning’s weakest MVP campaign. His 27 touchdowns and 7.2 yards per attempt were downright pedestrian, both by his standards and when you consider what it normally takes to win. If Harrison had won, no one would be looking back right now and wondering why. Woodson came into the league as a shutdown cover corner — and for a while, he was a great one — but 2009 was the season when we got to see the perfect version of the complete player he really was. The Packers slid Woodson into the slot that year, and he wreaked absolute havoc. The closer Woodson was to the ball, the more damage he did. The best season of Woodson’s career also helped turned the Packers into one of the league’s best defenses. Green Bay finished second in DVOA in 2009 after ending up 12th the year before. 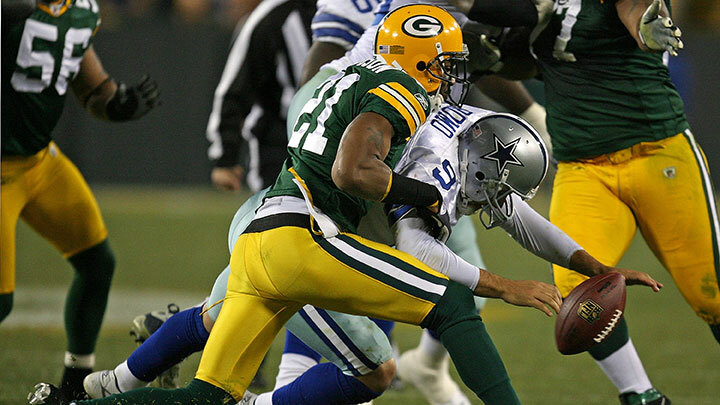 A rookie pass rusher named Clay Matthews helped, but Woodson was the driving force behind the Packers’ defense. Why he didn’t win: The Colts went 14-2. It should probably be more complicated than that, but it isn’t. Manning was only slightly better in 2009 than he was the season before, but Indy’s run through the league was still enough to earn him his third MVP. In a way, Watt’s 2012 is the point of all this. His recent barrage of touchdowns sets 2014 apart, but his level of dominance two years ago still trumps what he’s done through 13 games this year. Watt hit the magic 20-sack mark while batting balls and getting tackles for loss at a rate we’ve never seen before. Why he didn’t win: Adrian Peterson single-handedly dragged the Vikings to the playoffs with one of the greatest seasons a running back has ever had, but that shouldn’t be enough. Watt had his season on a playoff team that finished fourth in defensive DVOA. The reason Watt fell short in 2012 is the reason he will this year, and the reason so many others have before: Defensive players, no matter how dominant, just don’t win the MVP anymore. NHL Grab Bag: To Trade or Not to Trade?